Our fresh fuzzy skinned Kiwi fruits are the perfect addition to any fruit salad. Not only do they add a splash of colour but are great to add a slight sourness. Lovely new season Turkish Figs are in stock. William Pears are being sourced from France and our Conference Pears are currently from Holland. Williams Pears are the juiciest of the bunch as they have a sweet and soft texture. Our Conference Pears are the perfect dessert pear as they are firmed and hold their shape well when cooked. Crown Prince, Red Onion Squash and Mixed Squash are now available ready for the autumn count down. Our superb Piccolo Parsnips are a smaller, sweeter alternative to standard Parsnips. How about adding them to your dish with our Mixed Chanteney Carrots, great for both Autumn and Christmas menus! Calevo Nero aka our superb Black Cabbage has a subtle taste with a slight sweet aftertaste. Purple Sprouting is of a very good quality and a must on your menus! Tenderstem has a lovely fresh taste. We reccommend cooking them by bringing a pan of water to the boil, drop the Tenderstem in, bring the water to the boil and simmer for 2-3 mins. Sprouts in September.. yes, you read that right! We have a great supply of the first of many Sprouts… they aren’t just for Christmas! Chestnut Mushrooms are a great product this week! Fantastic nutty flavour thats a great addition to add to a pesto pasta salad. Feast is a celebration of the West Country’s best local food and drink. We are fortunate enough to be the main sponsor. We are very much looking forward to some great workshops to learn new skills from a great range of chefs. Why not bring the kids for a day out to enjoy our kids activities, scheduled throughout Saturday & Sunday. 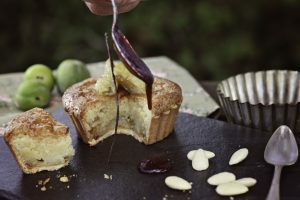 Greengage, Almond and Vanilla Tartlet! Good news! The quality conditions has greatly improved with Lambs Lettuce and we now are having a more consistent supply delivered. Basil is currently limited due to a disease called ‘Whitefly’. We are sourcing elsewhere so please bear with us when ordering. Sadly our summer greens are drawing to a close; Broad Beans, Runner Beans and Fresh Peas will finish so get them while you still can. Our wonderful English berry season is rapidly coming to an end and we will move onto airfreight Blackberries and Blueberries. This seasonal change will result in a slight price increase. And the Christmas Preparation begins! With only 15 weeks to go, you will probably be well underway preparing your Christmas Menu! Well why not let us help you? We can baton, slice, peel, dice, quarter, grate and much more… all prepared items are available by the 1kg, 2.5kg and 5kg quantities.